I have to be completely honest about this – the Blackberry Playbook may still be my favorite tablet. 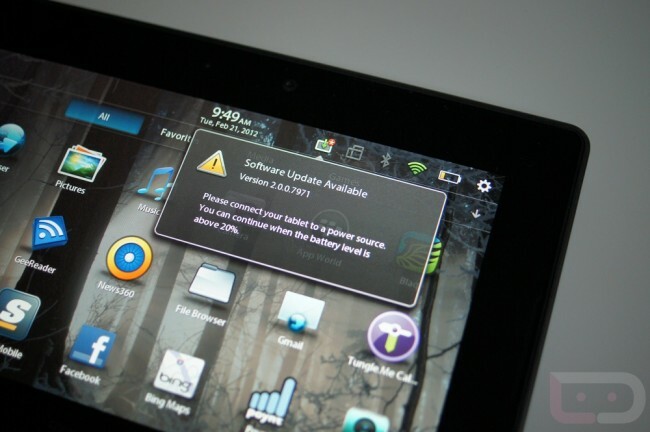 While the lack of apps and features at initial release killed it before it even got its start, the UI that RIM has put together on a tablet makes more sense than most. So when the 2.0 update for the device went live today, I actually got a little giddy. If you are not familiar, the 2.0 update for the Playbook introduces native email, Twitter and Facebook integration, new home screen UI, a new keyboard, enhanced browser and more. Most importantly though, it allows users to run Android apps that have been ported over to Blackberry’s App World. So yeah, this tablet essentially just turned into an Android tablet, but with a better UI (in my opinion anyway). I’m downloading 2.0 now and will hopefully have some hands-on time with it this afternoon. At $199 for the 16GB version, this may finally be worth your money if Android developers care to take the time to bring their work over.